The aim of this chapter is, in Section II. 1, to specify notation and parameters including the small gap case. In the literature, several different choices can be found, and quantitative comparisons of results are often difficult. Here we take the usual choice of nondimensionalization and parameters. In Section II.2 we describe the frame of all further analysis of our problem (except in Chapter VII where the spatial periodicity condition is released, and in Chapter VIII where a specific study is made in the small gap case). The idea is to be able to use ordinary differential equations techniques for the initial value problem. For this purpose, the simpler way is to fix the frame of the differential equation in some Hilbert space where the solution is differentiable in time. An element of this Hilbert space is then a velocity vector field of fluid particles. Therefore, to obtain the streamlines one has to find integral lines of this vector field. Section II.2 may be skipped by readers who are not very motivated by mathematical justifications of the analysis done in further chapters. 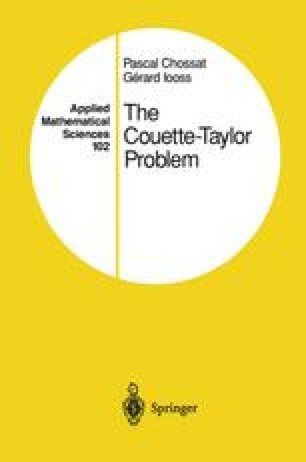 In Section II.3, we give general results on the linear stability of the Couette flow, and in Section II.4 we introduce the general tools used in the following chapters, i.e., the Center Manifold Theorem combined with symmetry and normal forms arguments.